I have received my mounted trophies, so the final piece of my African trip has finished. At least the final physical piece, the memories will last forever. Nikita van Aswegen from Karoo Taxidermy professionally and graciously handled my many requests and Karoo mounted our trophies perfectly. I was quoted 6-8 months for the completion of the trophies, everyone told me not to expect anything for at least a year. Today is 8 months to the day and they are mounted on the wall. Thank you for everything and the trophies look great. I will make sure to recommend you to everyone I come in contact with and when I am fortunate again to go the Africa, you will be who I call. I would like to say, in the US we have a saying about having the ability to “put 5 pounds of poop in a 3 pound sack” (of course we use the S word). This is a euphemism for someone’s ability to put a lot in a small space. I would say this saying fits your packing artisans. They did a masterful job of packing everything. When seeing the crate and hearing it held 9 shoulder mounts, everyone’s response was “no way”! The cradle has arrived safely to Sweden and everything inside was,according to me anyway,in perfect order,just as it has always been. Thank You for all the help. This year our group will not be in South Africa but for 2014 we aim at going the whole lot of us again. Looking forward to that and in the meantime I keep recommending You to everybody who go hunting in SA. I'm attaching several photos of the wonderful trophies you did for us now that they are installed so that you can see what they look like in place. Tyler and I are talking about a return hunt next June/July, so with luck we will see you then. Many thanks for all your help. Received my crate today GREAT JOB. All my trophies are in wonderful shape. Thank you so very much. See you next year. All of my trophies are on the wall & they look very nice, thank you. Karoo Taxidermy has done well & I would recommend them to others. Kudos to all. Hopefully, my son & I shall be in the Karoo in two years ( at which time I'd be 86 ). If we are able to make that trip, a day will be set aside to go to Graaff-Reinet & visit Karoo Taxidermy. oor en ik vind ze prachtig! Jullie hebben het echt heel erg mooi gedaan dus mijn welgemeende complimenten! Eveneens mijn complimenten voor de manier waarop de trofeeen verpakt waren; grote klasse! Heel veel dank en hou je haaks! 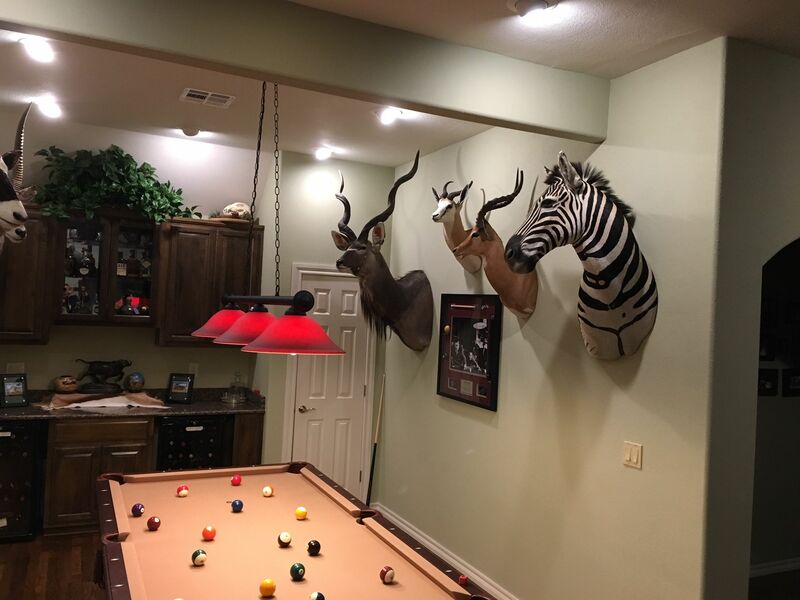 Received my animals and have them mounted. They are bigger than I remember. Every thing looked great and they were mounted beautifully. Thanks for all the help! Hope to see you soon! Have yesterday recieved my trophies. Its a very fine job. They are looking great. I will surely recommend Karoo Taxidermy to my friends and other hunters who come to SA for hunting and want their trophies mounted. Have a nice day. 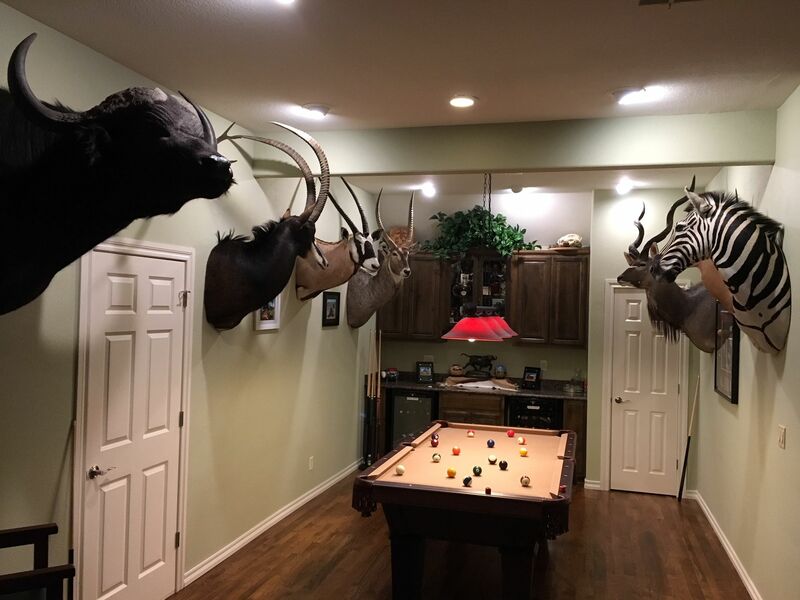 We got our trophies yesterday, thank you very much, it is very nice work, for sure we will use Karoo Taxidermy next time we visit South Africa, we will recommend Karoo for other hunters as well, I put a picture in this mail so you can se mine on my wall. Once again, thank you very much for the beatyfull work. Best regards. Diane and I want to thank each of you for preparing our trophy animals from South Africa and getting them safely to our home in Montana. They are beyond our dreams and expectations. What fabulous animals! They are already on display in our home. Thank you again for your expert, professional service. We notice and appreciate it. Just received my trophies. Bravo, Fantastic, Very Realistic, Excellent Workmanship, each one is a work of art. I love them. I can't even say the one I like the best. The Blue Wildebeest is spectacular. The Wart Hog is so life like you can hear him grunting. The Red Hartebeest, I can go on and on, just a wonderful job. I am a guest writer for Safari Club International so I usually not at a loss for words, but you guys just blew me away. Quality, Quality, Quality, your just the best. Thank You. My next safari is in May of 09, I hope to come by your shop to thank all of you personally. But till then please except my gratitude for a job well done. Thank You. I just opened the crate containing my trophies. Your work is incredible! Thank you very much for providing such wonderful and artistic services and creating such valuable memories. I can't wait to return to South Africa next September and send you more work. Our plans include more time touring Port Elizabeth and hopefully we can make arrangements to visit your facility and meet the staff. Best regards and have a great holiday season! Thank you for the great job done on my trophies. I highly recommend you to my friends in the USA.